BATON ROUGE, La. — Two inmates at Angola died Wednesday night of apparent drug overdoses, raising concerns in the Department of Corrections about correctional officers smuggling drugs — in particular synthetic marijuana or “mojo” — inside prison walls, officials said. The two deaths appear to be the first fatal overdoses in the Louisiana State Penitentiary at Angola within recent decades, according to Advocate reports. John Hatfield, 31, was found dead around 6:45 p.m. Wednesday and Kenneth LaCoste, 42, was found dead about two hours later. Both inmates were living on the same tier of a maximum security unit inside the prison, Laborde said in a news release. They died inside their cells. Contraband found in that area included small amounts of mojo and other drugs as well as a cellphone and pocket knife, authorities said. Hatfield was serving a life sentence for murder after being convicted in Beauregard Parish in 2016, and LaCoste was serving 10 years for habitual attempted distribution of cocaine. He was convicted in Orleans Parish in 2013 and was set for release in 2022. Prisoners were subjected to a shakedown search Thursday morning in response to the deaths, authorities said. More than 100 correctional officers and K9 teams searched the prison and found no other drugs, but did recover two icepick weapons, seven cellphones and four cellphone chargers. Angola warden Darryl Vannoy said during an April interview that his two main challenges were cellphones and mojo. He said officials work to ensure contraband doesn’t enter prison walls, but low pay and high turnover among staff makes it harder to solve the problems. Laborde also said officials have noticed an uptick in drugs being smuggled into state prisons in recent months. But she said investigations have not indicated whether prison staff was involved in distributing the drugs involved in this case. Officials have recently taken steps to address the problem, including tighter security and pay raises for corrections officers. Laborde said the department is in the process of installing new scanners at prisons across the state, which do a better job of detecting things like drugs hidden on a person’s body, rather than just metal objects. She said the current security system at Angola has all visitors passing through those more advanced scanners while staff often don’t have to. But soon everyone who enters the prison will be subject the new machines. Laborde also pointed to recent approval of plans to raise wages for COs across the state. Louisiana lawmakers have long discussed the problems associated with an extremely high turnover rate resulting in part from insufficient pay. 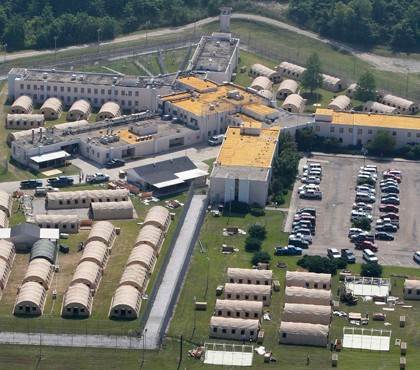 Corrections officials hope the increases will attract “better quality and more committed employees,” Laborde said. At least 16 Angola inmates have died from unnatural causes — most killed or committed suicide — over the past few decades, according to Advocate reports. None of those deaths resulted from drug overdoses. Before Wednesday’s overdoses, the most recent death occurred in February when a man died after a fight with his cellmate. Last year a CO shot and killed an inmate who was charging toward the officer. Of the 16 unnatural deaths since 1985, records show that about half were murders and half were suicides.